Funds to strengthen public/private BRAIN Initiative; establish new neuroscience institutes at Johns Hopkins University, The Rockefeller University and the University of California, San Francisco. The Kavli Foundation and its university partners announced today the commitment of more than $100 million in new funds to enable research aimed at deepening our understanding of the brain and brain-related disorders, such as traumatic brain injuries (TBI), Alzheimer’s disease and Parkinson’s disease. “Our ability to collect cellular neural data is growing at a Moore’s Law kind of doubling rate. At the same time, our ability to image the brain at different scales is producing massive data sets. One of the fundamental problems we all face now is how to connect the information that is being represented across scales. With this deluge of data, mathematical, algorithmic and computational models become perhaps more important today in neuroscience than ever before,” he said. 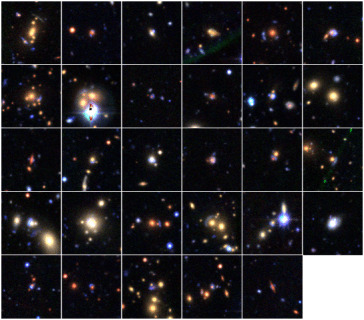 Around 37,000 citizen scientists combed through 430,000 images to help an international team of researchers to discover 29 new gravitational lens candidates through SpaceWarps, an online classification system which guides citizen scientists to become lens hunters. Since gravitational lenses are rare, only about 500 of them have been discovered to date, and the universe is enormous, it made sense for researchers to call on an extra pair of eyes to help scour through the mountain of images taken from the Canada-France-Hawaii Telescope [CFHT] Legacy Survey (CFHTLS). Details of the discoveries will be published in Monthly Notices of the Royal Astronomical Society. “Computer algorithms have been somewhat successful in identifying gravitational lenses, but they can miss lensed images that appear similar to other features commonly found in galaxies, for example the blue spiral arms of a spiral galaxy,” said Anupreeta More, co-principal investigator of Space Warps and project researcher at the University of Tokyo’s Kavli Institute for the Physics and Mathematics of the Universe. Not only did this project give the public a chance to make scientific discoveries, it also gave them a chance to develop as researchers themselves. “I benefited from this project with an increase of my knowledge and some experience on making models of lenses,” said citizen scientist and paper co-author Claude Cornen from France. To download preprint, click here. The results of this study are reported in the Proceedings of the National Academy of Sciences (PNAS) in a paper titled Optical antenna enhanced spontaneous emission. Yablonovitch and UC Berkeley’s Ming Wu are the corresponding authors. Other authors are Michael Eggleston, Kevin Messer and Liming Zhang. This research was supported by E3S, the U.S. Air Force Office of Scientific Research, and the U.S. Department of Energy’s Office of Science. COMPARED TO OTHER GALAXIES, the Milky Way is a peaceful place. But it hasn’t always been so sleepy. In 2010, a team of scientists working at the Harvard–Smithsonian Center for Astrophysics discovered a pair of “Fermi bubbles” extending tens of thousands of light-years above and below the Milky Way’s disk. These structures are enormous balloons of energetic gamma rays emanating from the center of our galaxy. They hint at a powerful event that took place millions of years ago, likely when the black hole at the center of our galaxy feasted on an enormous amount of gas and dust – perhaps several hundreds or even thousands of times the mass of the sun. But exactly how the bubbles formed, and the exact story they can tell us about the history of our galaxy, remains a mystery. Fresh from giving the January 6 Rossi Prize lecture at the Winter American Astronomical Society conference, three astrophysicists who discovered the Fermi bubbles spoke with The Kavli Foundation about ongoing attempts to understand the cause and implications of these unexpected and strange structures, as well as ways in which they may help in the hunt for dark matter. DOUGLAS FINKBEINER is a professor of astronomy and of physics at Harvard University and a member of the Institute for Theory and Computation at the Harvard–Smithsonian Center for Astrophysics. He was part of a collaboration that first discovered a gamma ray “haze” near the center of the Milky Way. TRACY SLATYER is an assistant professor of physics at the Massachusetts Institute of Technology and an Affiliated Faculty member at the MIT Kavli Institute for Astrophysics and Space Research. Working with Finkbeiner and Su, she showed that the gamma ray haze is in fact emission from two hot bubbles of plasma emanating from the galactic center. SLATYER: At the time, Doug, you told me something along the lines of “Scientific discoveries are more often heralded by ‘Huh, that looks funny’ than by ‘Eureka!’” When we first started seeing the edge of these bubbles emerge, I remember looking at the maps with Doug, who was pointing out where he thought there were edges, and not seeing them at all myself. And then more data started coming in and they became clearer and clearer – though it may have been Isaac Asimov who said it first. SU: No, actually, we expect to learn many new things from future observations. We’ll have additional satellites launching in the coming years that will offer better measurements of the bubbles. One surprising thing we’ve found is that the bubbles have a high-energy cut off. 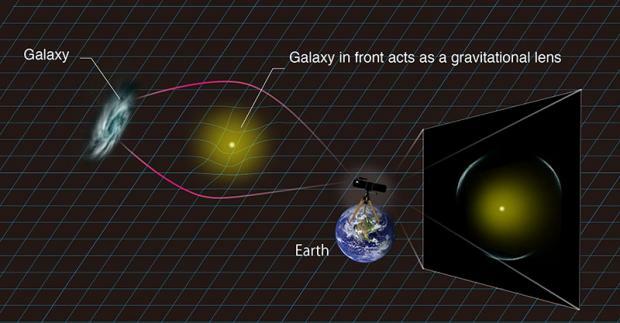 Basically, the bubbles stop shining in high-energy gamma rays at a certain energy. Above that, we don’t see any gamma rays and we don’t know why. So we hope to take better measurements that can tell us why this cutoff is happening. This can be done with future gamma-ray energy satellites, including one called Dark Matter Particle Explorer that will launch later this year. Although the satellite is focused on looking for signatures of dark matter, it will also be able to detect these high-energy gamma rays, even higher than the Fermi Gamma-ray Space Telescope, the telescope we used to discover the Fermi bubbles. That’s where the name of the structure came from. Likewise, we’re also interested in the lower energy gamma rays. There are some limitations with the Fermi satellite we’re currently using – the spatial resolution is not nearly as good for low-energy gamma rays. So we hope to launch another satellite in the future that can view the bubbles in low-energy gamma rays. I’m actually part of a team proposing to build this satellite, and I’m glad to find a good name for it: PANGU. It’s still in the early stages, but hopefully we can get the data within 10 years. 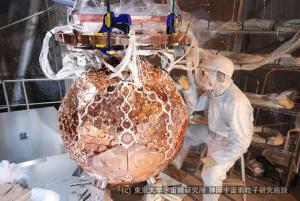 From this, we hope to learn more about the processes within the bubbles that lead to the emission of gamma rays. We need more data to understand this. SLATYER: Figuring out the exact origin of the bubbles is something I’m looking forward to. For example, if you make some basic assumptions, it looks like the gamma-ray signal has some very strange features. Particularly, the fact that the bubbles look so uniform all the way across is surprising. You wouldn’t expect the physics processes we think are taking place inside the bubbles to produce this uniformity. Are there multiple processes at work here? Does the radiation field within the bubbles look very different than what we expect? Is there an odd cancellation going on between the electron density and radiation field? These are just some of the questions we still have, questions that more observations – like the ones Meng was talking about – should shed light on. Putting together quotations from Richard Feynman and Valentine Telegdi, “Yesterday’s sensation is today’s calibration is tomorrow’s background.” The Fermi bubbles are certainly very interesting in their own right, and they’ll keep people busy for many years trying to figure out what they are. But they’re also a background or a foreground for any dark matter searches, and need to be understood for that reason too. See the full article here..
With some luck, that may be about to change. With ten times the sensitivity of previous detectors, three recently funded dark matter experiments have scientists crossing their fingers that they may finally glimpse these long-sought particles. In recent conversations with The Kavli Foundation, scientists working on these new experiments expressed hope that they would catch dark matter, but also agreed that, in the end, their success or failure is up to nature to decide. The first of the new experiments, called the Axion Dark Matter eXperiment, searches for a theoretical type of dark matter particle called the axion. ADMX seeks evidence of this extremely lightweight particle converting into a photon in the experiment’s high magnetic field. 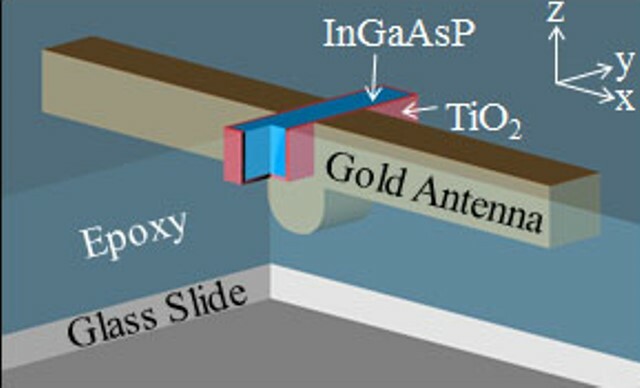 By slowly varying the magnetic field, the detector hunts for one axion mass at a time. The two other new experiments look for a different type of theoretical dark matter called the WIMP. Short for Weakly Interacting Massive Particle, the WIMP interacts with our world very weakly and very rarely. The Large Underground Xenon, or LUX, experiment, which began in 2009, is now getting an upgrade to increase its sensitivity to heavier WIMPs. Meanwhile, the Super Cryogenic Dark Matter Search collaboration, which has looked for the signal of a lightweight WIMP barreling through its detector since 2013, is in the process of finalizing the design for a new experiment to be located in Canada. Yet the nugget of gold for which all three experiments search is a very valuable one. And even though the search is difficult, all three scientists agreed that it’s worthwhile because glimpsing dark matter would reveal insight into a large portion of the universe. 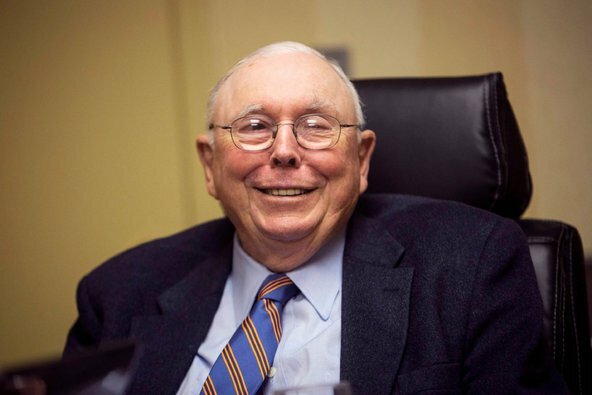 Charles T. Munger has been known for many things over his decades-long career, including longtime business partner of Warren E. Buffett; successful investor and lawyer; and plain-spoken commentator with a wide following. Now Mr. Munger, 90, can add another title to that list: deep-pocketed benefactor to the field of theoretical physics. He was expected to announce on Friday that he has donated $65 million to the Kavli Institute for Theoretical Physics at the University of California, Santa Barbara. The gift — the largest in the school’s history — will go toward building a 61-bed residence for visitors to the institute, which brings together physicists for weeks at a time to exchange ideas. The donation is the latest gift by Mr. Munger, a billionaire who has not been shy in giving away the wealth he has accumulated as vice chairman of Mr. Buffett’s Berkshire Hathaway to charitable causes. The biggest beneficiary of his largess thus far has been the University of Michigan, his alma mater. Last year alone, he gave $110 million worth of Berkshire shares — one of the biggest gifts in the university’s history — to create a new residence intended to help graduate students from different areas of study mingle and share ideas. That same idea of intellectual cross-pollination underpins the Kavli Institute, which over 35 years has established itself as a haven for theoretical physicists from around the world to meet and discuss potential new developments in their field. Funded primarily by the National Science Foundation, the institute has produced advances in the understanding of white dwarf stars, string theory and quantum computing. A former director of the institute, David J. Gross, shared in the 2004 Nobel Prize in Physics for work that shed new light on the fundamental force that binds together the atomic nucleus. To Mr. Munger, such interactions are crucial for the advancement of physics. He cited international conferences attended by the likes of [Albert]Einstein and Marie Curie. Mr. Munger himself did not study physics for very long, having taken a class at the California Institute of Technology while in the Army during World War II. But as an avid reader of scientific biography, he came to appreciate the importance of the field. And he praised the rise of the University of California, Santa Barbara, as a leading haven for physics, particularly given its status as a relatively young research institution. But while the Kavli Institute conducts various programs throughout the year for visiting scientists, it has long lacked a way for physicists to spend time outside of work hours during their stays. A permanent residence hall would allow them to mingle even more, in the hope of fostering additional eureka moments. “We want to make their hardest choice, ‘Which barbecue to go to?’ ” Mr. Bildsten joked. Though Mr. Munger has some ties to the University of California, Santa Barbara — a grandson is an alumnus — he was first introduced to the Kavli Institute through a friend who lives in Santa Barbara. During one of the pair’s numerous fishing trips, that friend, Glen Mitchel, asked the Berkshire vice chairman to help finance construction of a new residence. The university had already reserved a plot of land for the dormitory in case the institute raised the requisite funds. “It wasn’t a hard sell,” Mr. Munger said. The XMASS collaboration, led by Yoichiro Suzuki at the Kavli IPMU, has reported its latest results on the search for warm dark matter. Their results rule out the possibility that super-weakly interacting massive bosonic particles (bosonic super-WIMPs) constitute all dark matter in the universe. This result was published in the September 19th issue of the Physical Review Letters as an Editors’ Suggestion. Various theoretical models have been proposed to explain the nature of dark matter. Some models extend the standard model of particle physics, such as super-symmetry, and suggest that weakly interacting massive particles (WIMPs) are dark matter candidates. These models have motivated most experimental research on dark matter. In discussions on the large-scale structure formation of the universe, these WIMPs fit the cold dark matter (CDM) paradigm. Scientists from TU Delft’s Kavli Institute of Nanoscience have demonstrated that they can detect extremely small changes in position and forces on very small drums of graphene. Graphene drums have great potential to be used as sensors in devices such as mobile phones. Using their unique mechanical properties, these drums could also act as memory chips in a quantum computer. The researchers present their findings in an article in the August 24th edition of Nature Nanotechnology. The research was funded by the FOM Foundation, the EU Marie-Curie program, and NWO. Graphene is famous for its special electrical properties, but research on the one-layer thin graphite was recently expanded to explore graphene as a mechanical object. Thanks to their extreme low mass, tiny sheets of graphene can be used the same was as the drumhead of a musician. In the experiment, scientists use microwave-frequency light to ‘play’ the graphene drums, to listen to its ‘nano sound’, and to explore the way graphene in these drums moves. Dr. Vibhor Singh and his colleagues did this by using a 2D crystal membrane as a mirror in an ‘optomechanical cavity’. 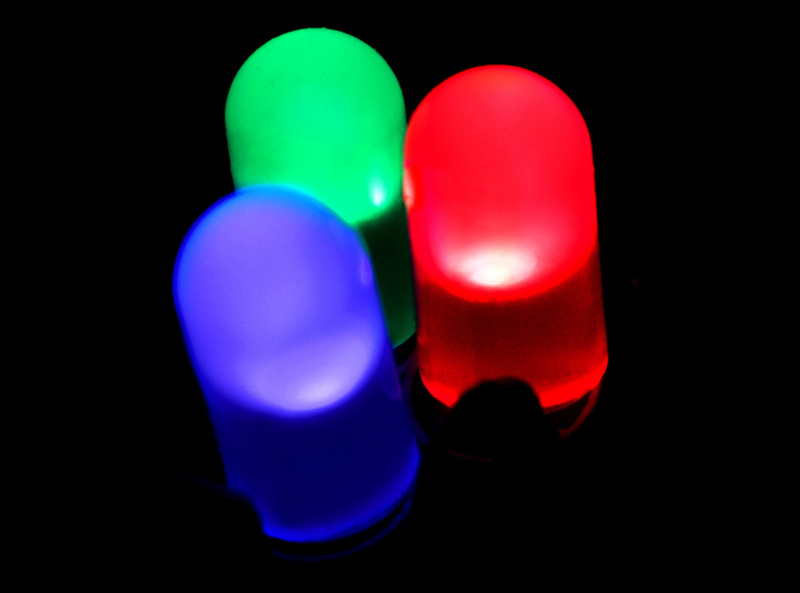 “In optomechanics you use the interference pattern of light to detect tiny changes in the position of an object. 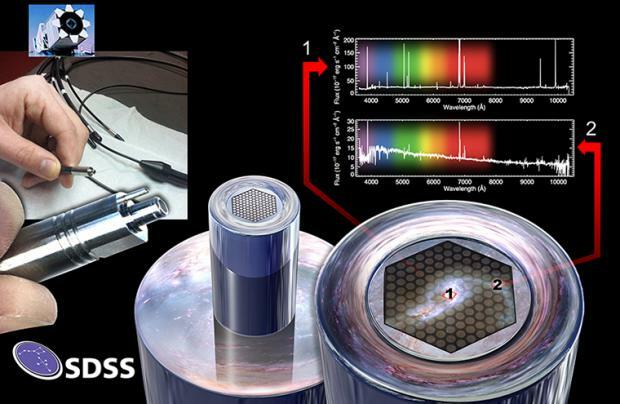 In this experiment, we shot microwave photons at a tiny graphene drum. The drum acts as a mirror: by looking at the interference of the microwave photons bouncing off of the drum, we are able to sense minute changes in the position of the graphene sheet of only 17 femtometers, nearly 1/10000th of the diameter of an atom.”, Singh explains. The microwave ‘light’ in the experiment is not only good for detecting the position of the drum, but can also push on the drum with a force. This force from light is extremely small, but the small mass of the graphene sheet and the tiny displacements they can detect mean that the scientist can use these forces to ‘beat the drum’: the scientists can shake the graphene drum with the momentum of light. Using this radiation pressure, they made an amplifier in which microwave signals, such as those in your mobile phone, are amplified by the mechanical motion of the drum. The scientists also show you can use these drums as ‘memory chips’ for microwave photons, converting photons into mechanical vibrations and storing them for up to 10 milliseconds. Although that is not long by human standards, it is a long time for a computer chip. “One of the long-term goals of the project is explore 2D crystal drums to study quantum motion. If you hit a classical drum with a stick, the drumhead will start oscillating, shaking up and down. With a quantum drum, however, you can not only make the drumhead move up and then down, but also make it into a ‘quantum superposition’, in which the drum head is both moving up and moving down at the same time ”, says research group leader Dr. Gary Steele. “This ‘strange’ quantum motion is not only of scientific relevance, but also could have very practical applications in a quantum computer as a quantum ‘memory chip’”. In a quantum computer, the fact that quantum ‘bits’ that can be both in the state 0 and 1 at the same time allow it to potentially perform computations much faster than a classical computer like those used today. Quantum graphene drums that are ‘shaking up and down at the same time’ could be used to store quantum information in the same way as RAM chips in your computer, allowing you to store your quantum computation result and retrieve it at a later time by listening to its quantum sound. A new survey called MaNGA (Mapping Nearby Galaxies at Apache Point Observatory) has been launched that will greatly expand our understanding of galaxies, including the Milky Way, by charting the internal structure and composition of an unprecedented sample of 10,000 galaxies. MaNGA is a part of the fourth generation Sloan Digital Sky Survey (SDSS-IV) and will make maps of stars and gas in galaxies to determine how they have grown and changed over billions of years, using a novel optical fiber bundle technology that can take spectra of all parts of a galaxy at the same time. The new survey represents a collaboration of more than 200 astronomers at more than 40 institutions on four continents. With the new technology, astronomers will gain a perspective on the building blocks of the universe with a statistical precision that has never been achieved before. “Because the life story of a galaxy is encoded in its internal structure—a bit like the way the life story of a tree is encoded in its rings—MaNGA would, for the first time, enable us to map the evolutionary histories of galaxies of all types and sizes, living in all kinds of environments,” said Kevin Bundy, MaNGA’s Principal Investigator from the Kavli Institute for the Physics and Mathematics of the Universe, the University of Tokyo. This new survey will provide a vast public database of observations that will significantly expand astronomer’s understanding of how tiny differences in the density of the early universe evolved over billions of years into the rich structure of galaxies today. This cosmic story includes the journey of our own Milky Way galaxy from its origins to the birth of our sun and solar system, and eventually the necessary conditions that gave rise to life on Earth. “MaNGA will not only teach us about what shapes the appearance of normal galaxies,” said SDSS Project Scientist, Matthew Bershady from the University of Wisconsin, Madison. “It will also almost surely surprise us with new discoveries about the origin of dark matter, super-massive black holes, and perhaps even the nature of gravity itself.” This potential comes from MaNGA’s ability to paint a complete picture of each galaxy using an unprecedented amount of spectral information on the chemical composition and motions of stars and gas. To realize this potential, the MaNGA team has developed new technologies for bundling sets of fiber-optic cables into tightly-packed arrays that dramatically enhance the capabilities of existing instrumentation on the 2.5-meter Sloan Foundation Telescope in New Mexico. Unlike nearly all previous surveys, which combine all portions of a galaxy into a single spectrum, MaNGA will obtain as many as 127 different measurements across the full extent of every galaxy. Its new instrumentation enables a survey of more than 10,000 nearby galaxies at twenty times the rate of previous efforts, which did one galaxy at a time. But local galaxy studies are far from the only astronomical topic the new SDSS will explore. Another core program called APOGEE-2 will chart the compositions and motions of stars across the entire Milky Way in unprecedented detail, using a telescope in Chile along with the existing Sloan Foundation Telescope. And the new SDSS will continue to improve our understanding of the Universe as a whole. The third core program, eBOSS, will precisely measure the expansion history of the Universe through 80% of cosmic history, back to when the Universe was less than three billion years old. These new detailed measurements will help to improve constraints on the nature of dark energy, the most mysterious experimental result in modern physics. With new technology and surveys like MaNGA and the continuing generous support of the Alfred P. Sloan Foundation and participating institutions, the SDSS will remain one of the world’s most productive astronomical facilities. Science results from the SDSS will continue to reshape our view of the fundamental constituents of the cosmos, the universe of galaxies, and our home in the Milky Way. 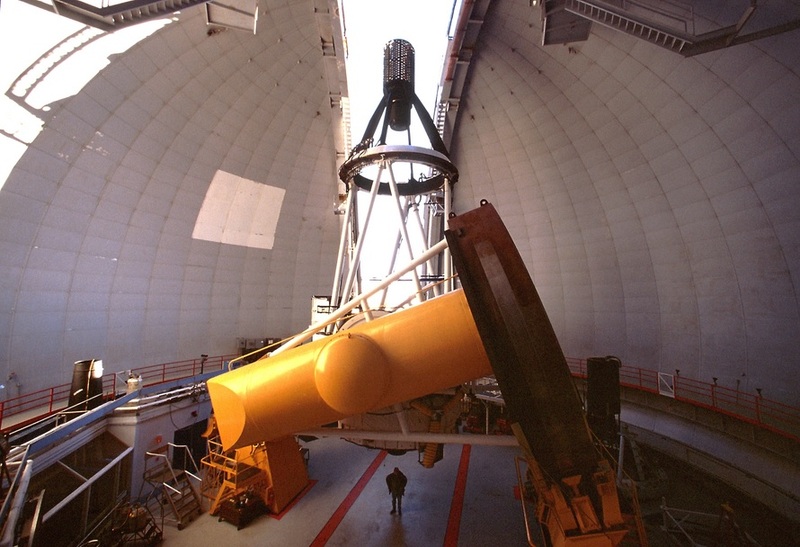 Funding for the Sloan Digital Sky Survey IV has been provided by the Alfred P. Sloan Foundation and the Participating Institutions. SDSS-IV acknowledges support and resources from the Center for High-Performance Computing at the University of Utah. 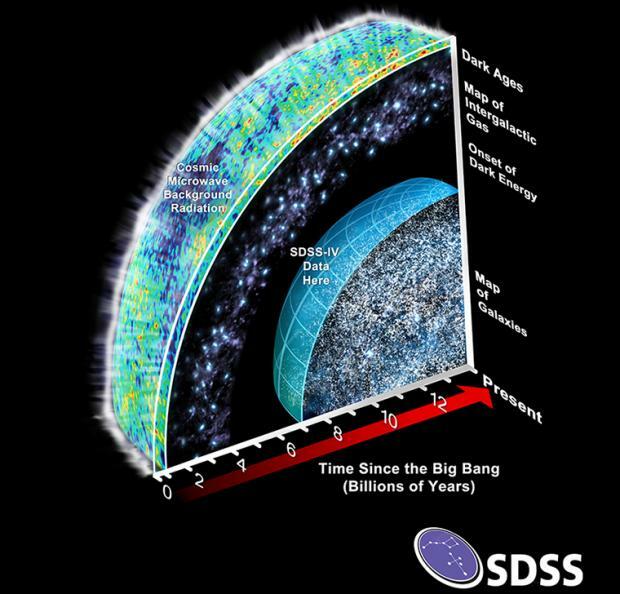 SDSS-IV is managed by the Astrophysical Research Consortium for the Participating Institutions of the SDSS Collaboration including the Carnegie Institution for Science, Carnegie Mellon University, the Chilean Participation Group, Harvard-Smithsonian Center for Astrophysics, Instituto de Astrofisica de Canarias, The Johns Hopkins University, Kavli Institute for the Physics and Mathematics of the Universe (Kavli IPMU) / University of Tokyo, Lawrence Berkeley National Laboratory, Leibniz Institut fur Astrophysik Potsdam (AIP),Max-Planck-Institut fur Astrophysik (MPA Garching), Max-Planck-Institut fur Extraterrestrische Physik (MPE), Max-Planck-Institut fur Astronomie (MPIA Heidelberg), National Astronomical Observatory of China, New Mexico State University, New York University, The Ohio State University, Pennsylvania State University, Shanghai Astronomical Observatory, United Kingdom Participation Group, Universidad Nacional Autonoma de Mexico, University of Arizona, University of Colorado Boulder, University of Portsmouth, University of Utah, University of Washington, University of Wisconsin, Vanderbilt University, and Yale University. See the full article, with video and additional material here. Understanding the origins of our solar system, the future of our planet or humanity requires complex calculations run on high-power computers. A common thread among research efforts across Stanford’s many disciplines is the growing use of sophisticated algorithms, run by brute computing power, to solve big questions. In Earth sciences, computer models of climate change or carbon sequestration help drive policy decisions, and in medicine computation is helping unravel the complex relationship between our DNA and disease risk. Even in the social sciences, computation is being used to identify relationships between social networks and behaviors, work that could influence educational programs. “There’s really very little research that isn’t dependent on computing,” says Ann Arvin, vice provost and dean of research. Arvin helped support the recently opened Stanford Research Computing Center (SRCC) located at SLAC National Accelerator Laboratory, which expands the available research computing space at Stanford. The building’s green technology also reduces the energy used to cool the servers, lowering the environmental costs of carrying out research. Here are just a few examples of how Stanford faculty are putting computers to work to crack the mysteries of our origins, our planet and ourselves. Myths once explained our origins. Now we have algorithms. Q: How did the universe form? For thousands of years, humans have looked to the night sky and created myths to explain the origins of the planets and stars. The real answer could soon come from the elegant computer simulations conducted by Tom Abel, an associate professor of physics at Stanford. Cosmologists face an ironic conundrum. By studying the current universe, we have gained a tremendous understanding of what occurred in the fractions of a second after the Big Bang, and how the first 400,000 years created the ingredients – gases, energy, etc. – that would eventually become the stars, planets and everything else. But we still don’t know what happened after those early years to create what we see in the night sky. Easier said than done. Abel’s calculations must incorporate the laws of chemistry, atomic physics, gravity, how atoms and molecules radiate, gas and fluid dynamics and interactions, the forces associated with dark matter and so on. Those processes must then be simulated out over the course of hundreds of millions, and eventually billions, of years. Further complicating matters, a single galaxy holds one billion moving stars, and the simulation needs to consider their interactions in order to create an accurate prediction of how the universe came to be. Q: How did we evolve? The human genome is essentially a gigantic data set. Deep within each person’s six billion data points are minute variations that tell the story of human evolution, and provide clues to how scientists can combat modern-day diseases. To better understand the causes and consequences of these genetic variations, Jonathan Pritchard, a professor of genetics and of biology, writes computer programs that can investigate those links. “Genetic variation affects how cells work, both in healthy variation and in response to disease,” Pritchard says. How that variation displays itself – in appearance or how cells work – and whether natural selection favors those changes within a population drives evolution. Consider, for example, variation in the gene that codes for lactase, an enzyme that allows mammals to digest milk. Most mammals turn off the lactase gene after they’ve been weaned from their mother’s milk. In populations that have historically revolved around dairy farming, however, Pritchard’s algorithms have helped to elucidate signals of strong selection since the advent of agriculture to enable people to process milk active throughout life. There has been similarly strong selection on skin pigmentation in non-Africans that allow better synthesis of vitamin D in regions where people are exposed to less sunlight. The algorithms and machine learning methods Pritchard used have the potential to yield powerful medical insights. Studying variations in how genes are regulated within a population could reveal how and where particular proteins bind to DNA, or which genes are turned on in different cell types­ – information that could help design novel therapies. These inquiries can generate hundreds of thousands of data sets and can only be parsed with up to tens of thousands of hours of computer work. Pritchard is bracing for an even bigger explosion of data; as genome sequencing technologies become less expensive, he expects the number of individually sequenced genomes to jump by as much as a hundredfold in the next few years. “Storing and analyzing vast amounts of data is a fundamental challenge that all genomics groups are dealing with,” says Pritchard, who is a member of Stanford Bio-X. 7 billion people live on Earth. Computers might help us survive ourselves. Q: How can we predict future climates? There is no lab large enough to conduct experiments on the global-scale interactions between air, water and land that control Earth’s climate, so Stanford’s Noah Diffenbaugh and his students use supercomputers. Computer simulations reveal that if human emissions of greenhouse gases continue at their current pace, global warming over the next century is likely to occur faster than any global-scale shift recorded in the past 65 million years. This will increase the likelihood and severity of droughts, heat waves, heavy downpours and other extreme weather events. Climate scientists must incorporate into their predictions a growing number of data streams – including direct measurements as well as remote-sensing observations from satellites, aircraft-based sensors, and ground-based arrays. “That takes a lot of computing power, especially as we try to figure out how to use newer unstructured forms of data, such as from mobile sensors,” says Diffenbaugh, an associate professor of environmental Earth system science and a senior fellow at the Stanford Woods Institute for the Environment. Diffenbaugh’s team plans to use the increased computing resources available at SRCC to simulate air circulation patterns at the kilometer-scale over multiple decades. This has rarely been attempted before, and could help scientists answer questions such as how the recurring El Niño ocean circulation pattern interacts with elevated atmospheric carbon dioxide levels to affect the occurrence of tornadoes in the United States. “We plan to use the new computing cluster to run very large high-resolution simulations of climate over regions like the U.S. and India,” Diffenbaugh says. One of the most important benefits of SRCC, however, is not one that can be measured in computing power or cycles. Q: How can we predict if climate solutions work? The capture and trapping of carbon dioxide gas deep underground is one of the most viable options for mitigating the effects of global warming, but only if we can understand how that stored gas interacts with the surrounding structures. Hamdi Tchelepi, a professor of energy resources engineering, uses supercomputers to study interactions between injected CO2 gas and the complex rock-fluid system in the subsurface. “Carbon sequestration is not a simple reversal of the technology that allows us to extract oil and gas. The physics involved is more complicated, ranging from the micro-scale of sand grains to extremely large geological formations that may extend hundreds of kilometers, and the timescales are on the order of centuries, not decades,” says Tchelepi, who is also the co-director of the Stanford Center for Computational Earth and Environmental Sciences (CEES). For example, modeling how a large plume of CO2 injected into the ground migrates and settles within the subsurface, and whether it might escape from the injection site to affect the air quality of a faraway city, can require the solving of tens of millions of equations simultaneously. SRCC will help augment the high computing power already available to Stanford Earth scientists and students through CEES, and will serve as a testing ground for custom algorithms developed by CEES researchers to simulate complex physical processes. Tchelepi, who is also affiliated with the Precourt Institute for Energy, says people are often surprised to learn the role that supercomputing plays in modern Earth sciences, but Earth scientists use more computer resources than almost anybody except the defense industry, and their computing needs can influence the designs of next-generation hardware. Q: How can we build more efficent energy networks? Today, utility companies base forecasts on a 24-hour cycle that aggregates millions of households. Not surprisingly, power use peaks in the morning and evening, when people are at home. But when Rajagopal looked at 1.6 billion hourly data points he plotted dramatic variations. Some households conformed to the norm and others didn’t. This forms the statistical underpinning for a new way to price and purchase power – by aggregating as few as a thousand customers into a unit with a predictable usage pattern. “If we want to thwart global warming we need to give this technology to communities,” says Rajagopal. Some consumers might want to pay whatever it costs to stay cool on hot days, others might conserve or defer demand to get price breaks. “I’m talking about neighborhood power that could be aligned to your beliefs,” says Rajagopal. Know thyself. Let computation help. Q: How does our DNA make us who we are? Our DNA is sometimes referred to as our body’s blueprint, but it’s really more of a sketch. Sure, it determines a lot of things, but so do the viruses and bacteria swarming our bodies, our encounters with environmental chemicals that lodge in our tissues and the chemical stew that ensues when our immune system responds to disease states. All of this taken together – our DNA, the chemicals, the antibodies coursing through our veins and so much more – determines our physical state at any point in time. And all that information makes for a lot of data if, like genetics professor Michael Snyder, you collected it 75 times over the course of four years. Snyder is a proponent of what he calls “personal omics profiling,” or the study of all that makes up our person, and he’s starting with himself. “What we’re collecting is a detailed molecular portrait of a person throughout time,” he says. So far, he’s turning out to be a pretty interesting test case. In one round of assessment he learned that he was becoming diabetic and was able to control the condition long before it would have been detected through a periodic medical exam. If personal omics profiling is going to go mainstream, serious computing will be required to tease out which of the myriad tests Snyder’s team currently runs give meaningful information and should be part of routine screening. Snyder’s sampling alone has already generated a half of a petabyte of data – roughly enough raw information to fill about a dishwasher-size rack of servers. Right now, that data and the computer power required to understand it reside on campus, but new servers will be located at SRCC. “I think you are going to see a lot more projects like this,” says Snyder, who is also a Stanford Bio-X affiliate and a member of the Stanford Cancer Center. Q: How do we learn to read? A love letter, with all of its associated emotions, conveys its message with the same set of squiggly letters as a newspaper, novel or an instruction manual. How our brains learn to interpret a series of lines and curves into language that carries meaning or imparts knowledge is something psychology Professor Brian Wandell has been trying to understand. Wandell hopes to tease out differences between the brain scans of kids learning to read normally and those who are struggling, and use that information to find the right support for kids who need help. “As we acquire information about the outcome of different reading interventions we can go back to our database to understand whether there is some particular profile in the child that works better with intervention 1, and a second profile that works better with intervention 2,” says Wandell, a Stanford Bio-X member who is also the Isaac and Madeline Stein Family Professor and professor, by courtesy, of electrical engineering. His team developed a way of scanning kids’ brains with magnetic resonance imaging, then knitting the million collected samples together with complex algorithms that reveal how the nerve fibers connect different parts of the brain. “If you try to do this on your laptop, it will take half a day or more for each child,” he says. Instead, he uses powerful computers to reveal specific brain changes as kids learn to read. Wandell is associate director of the Stanford Neurosciences Institute, where he is leading the effort to develop a computing strategy – one that involves making use of SRCC rather than including computing space in their planned new building. He says one advantage of having faculty share computing space and systems is to speed scientific progress. Q: How do we work effectively together? There comes a time in every person’s life when it becomes easy to settle for the known relationship, for better or for worse, rather than seek out new ties with those who better inspire creativity and ensure success. Or so finds Daniel McFarland, professor of education and, by courtesy, of organizational behavior, who has studied how academic collaborations form and persist. 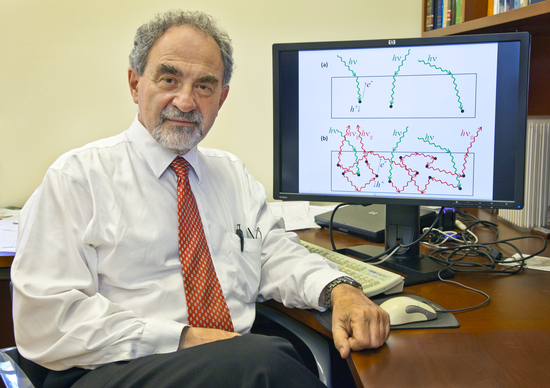 McFarland and his own collaborators tracked signs of academic ties such as when Stanford faculty co-authored a paper, cited the same publications or got a grant together. Armed with 15 years of collaboration output on 3,000 faculty members, they developed a computer model of how networks form and strengthen over time. “Social networks are large, interdependent forms of data that quickly confront limits of computing power, and especially so when we study network evolution,” says McFarland. Their work has shown that once academic relationships have established, they tend to continue out of habit, regardless of whether they are the most productive fit. He argues that successful academic programs or businesses should work to bring new members into collaborations and also spark new ties to prevent more senior people from falling back on known but less effective relationships. At the same time, he comes down in favor of retreats and team building exercises to strengthen existing good collaborations. Q: What can computers tell us about how our body works? As you sip your morning cup of coffee, the caffeine makes its way to your cells, slots into a receptor site on the cells’ surface and triggers a series of reactions that jolt you awake. A similar process takes place when Zantac provides relief for stomach ulcers, or when chemical signals produced in the brain travel cell-to-cell through your nervous system to your heart, telling it to beat. In each of these instances, a drug or natural chemical is activating a cell’s G-protein coupled receptor (GPCR), the cellular target of roughly half of all known drugs, says Vijay Pande, a professor of chemistry and, by courtesy, of structural biology and of computer science at Stanford. This exchange is a complex one, though. In order for caffeine or any other molecule to influence a cell, it must fit snugly into the receptor site, which consists of 4,000 atoms and transforms between an active and inactive configuration. Current imaging technologies are unable to view that transformation, so Pande has been simulating it using his Folding@Home distributed computer network. So far, Pande’s group has demonstrated a few hundred microseconds of the receptor’s transformation. Although that’s an extraordinarily long chunk of time compared to similar techniques, Pande is looking forward to accessing the SRCC to investigate the basic biophysics of GPCR and other proteins. Greater computing power, he says, will allow his team to simulate larger molecules in greater detail, simulate folding sequences for longer periods of time and visualize multiple molecules as they interact. It might even lead to atom-level simulations of processes at the scale of an entire cell. All of this knowledge could be applied to computationally design novel drugs and therapies.